15 years ago today, Dandy was worried about getting enough to eat. OK, so what's all this? Something is going on, and I don't like the look of it. We had a really nice day yesterday, lots of food and attention, and were not requested to hop back in to our Condo until almost midnight, but something strange is afoot. This morning, as well as our usual treat stick, our 2-foots gave us some greens. Now I'm not complaining you understand, a bun can NEVER have 2 much food... well they can, it's not good for them to have too much food, BUT I LIKE HAVING TOO MUCH FOOD! The thing is though, why did they give us greens this morning? it does not make sense! Like you say it seems strange. But consider you lucky, our 2-foots don't give us any greens. We will have to teach them. They say that it is because we are still too young and also they are not too sure which greens to give us first. Apparently we live in what it's called "town". Strange we always thought it was called hutch or condo... (these 2-foots don't seem to be speaking the same language as us) Anyway, the point is that they can't find blackberry leaves, so they don't know what to give us first to start with... Maybe they should try to give us some carrot tops? Ah yes. 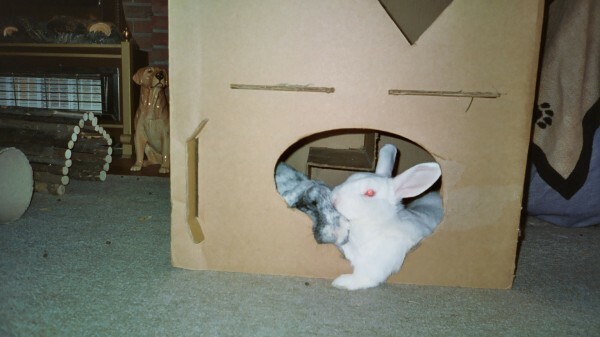 I remember when I was a young bun, I was not allowed any greens either. When you get a little bit older, then your 2-foots start you off with a bit of parsley as a treat, and as long as that does not upset your digestion, then they can try you with some spring cabbage. Carrot tops are fantastic, and so are the orange bits, but we are not allowed too many as they have quite a bit of natural sugar in them. The most important thing when you do start eating greens is to do it gradually, and only to introduce them one at a time, otherwise, you can end up being really poorly, and believe me, that's no fun!